Very good leather seats and wooden dash. Originally fitted with a mohair hood. The current unit is serviceable and in vinyl. The car would be much improved by a new mohair hood to the original specification. Russ Swift converted Minis from 1984 to 1990, 2 of which were converted for Rover Cars Limited for promotional use - numbers 42 & 43. Number 43 was also used by Rover Cars during a design study with a view to manufacturing an official factory model which they went on to produce in 1993. 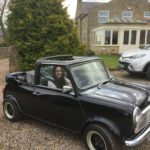 7 Russ Swift Mini convertibles are still known to exist and are highly prized by long term owners.